Suris are a breed of alpaca, and is a domesticated member of the South American camelid family that include llamas, guanacos and vicunas. The camelid family also includes the Bactrian (2-humped) and Dromedary (1-humped) camels. Alpacas are native to South America with about 4.5 million alpacas in the Andean highlands, with 4.0 million of them located mostly in Peru, and the balance located also in Chile and Bolivia. Alpaca are renowned for their luxury fiber which has superior handle (luxurious and pleasing feel), softness and luster. 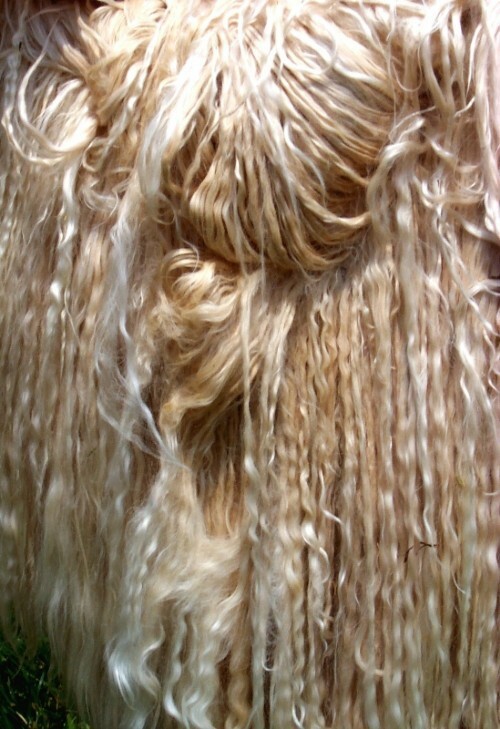 Of the two types of alpaca—the huacaya and the suri—the huacaya is the more numerous of the two and has a fleece similar in characteristics to the merino breed of sheep, with a soft, fluffy teddy bear appearance of fiber that stands out from the body like a thick carpet and defined crimp (zigzag nature of the individual fibers). 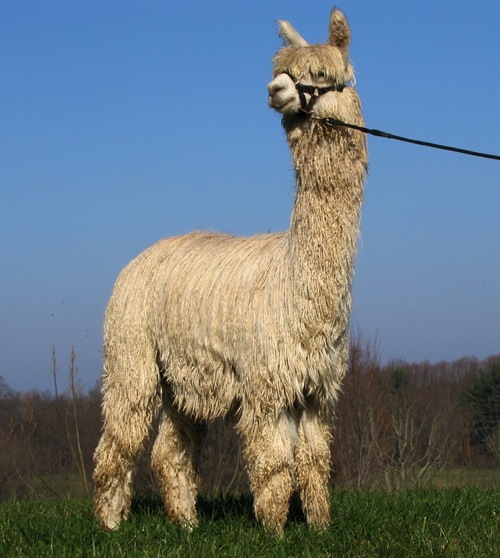 The suri, however, comprising only 10% of the world’s alpacas, has an elegantly draped slick, shiny fleece that hangs down from its body in long twisted strings, or locks. Suri fiber is prized for its unique luster and superb soft, slick of handle. It is used primarily for producing fine textiles and elegant knitwear requiring a soft, flowing, and drapey appearance. It is highly sought after by fashion houses because of it rarity, bringing a premium price in the fiber market. Since the first major import into the US in 1984, the total number of huacaya and suri alpacas here has increased to more than 150,000. Of these, the US suri herd comprises only 26,500 animals. Alpacas come in a range of 22 natural colors, the most of any fiber animal and including white, various shades of fawn and brown, grey, black, and combination patterns like pinto and appaloosa. Alpaca are believed to have been created through selective breeding of the wild vicuna about 6000 years ago, by the Andean people in South America. 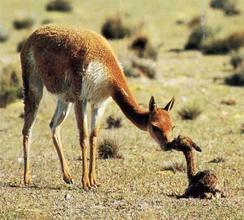 They live in the high altitudes of the treeless altiplano, about 14,000 feet or 4200 m above sea level. The Incas prized the cloth made from alpaca so highly that it was used as a form of currency and only royalty were permitted to wear cloth made from suri fiber. The alpaca and llama were also important as a source of food and as pack animals. The Incas developed a superior animal which had a finer and more even fleece than that seen in alpacas today. These genetics were largely lost as a result of the Spanish invasion in the 1500s, when up to 90% of alpaca were killed to make way for European livestock, which the Spanish valued more highly. The suri alpaca, although it exhibits genetic dominance over the huacaya type, is very rare in South America. It is thought that as the alpacas and their herders were forced higher into the Andean mountains by the conquistadors, the openness of their fleece or defined part along the back line made them more susceptible to the extreme conditions found at such high altitudes. 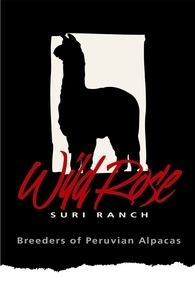 The number of suri in Peru continues to decline, hence the importance of new alpaca breeding nations like the United States, Australia, Canada, and New Zealand. 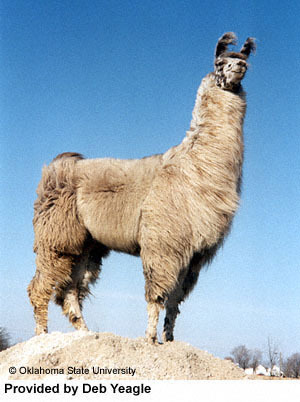 Suri population censuses quoted from various authorities run across the board from ONLY 1% to 4% of the alpaca populations. 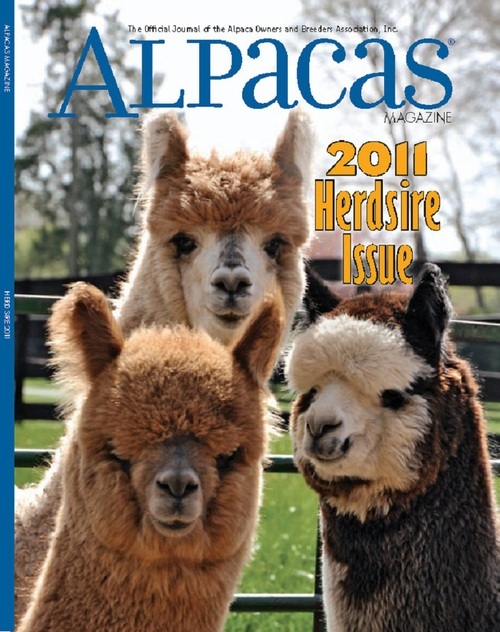 World renowned Veterinarian and Peruvian alpaca breeder, Dr. Julio Sumar, has been extensively involved with alpacas and feels strongly that the suri population in Peru is around 1%. If you pick, just to be safe, the high of 4% the suri population worldwide would be approximately 120,000. This is about half that of the vicuña population (an endangered species) of 250,000. Estimates of the number of colored suris are 5% of the total world suri population which leaves approximately 6,000 colored suris world wide. This is a staggeringly small number. This scarcity becomes reality when searching for colored suris in Peru and Bolivia, for one has to comb hundreds of square miles of specific locations to find a few colored suris. September 1999 Alpaca Market Report by International Alpaca Association – Don Julio Barreda of the noted Accoyo Estancia in Peru and creator of the Accoyo bloodline noted the slow disappearance of suris during the past thirty years and challenges all groups with interest to form a program of recovery and preservation for the suri alpaca. As quoted by Don Julio Barreda, ‘Nevertheless, it depends mainly on us, the breeders to bring about the recovery of this beautiful animal that once appeared to have fallen from the sky like hail as a gift to the Ccollas, Quechuas and Aymaras and today needs to be shared with the whole world’. Almost all of the shorn suri fleece can be used to make products when sorted into the different grade - very little waste! Specialty interior fabrics and textiles. Worldwide, suri is most commonly made up into overcoats which are brushed to bring out its natural luster. In Australia, some enterprising and highly skilled breeders in Queensland are hand spinning suri fleece to produce gossamer-thin thread for lacework shawls and even wedding dresses. When the fashion trade demands suri, the orders are hard to fill and the price increases rapidly. The majority is sold to Italy, with smaller markets being US, Europe and Japan. Research data has shown that suri fleece may have a higher density and yield than that of huacaya. In processing, the yield of suri fiber is 90% compared to 43-76% for sheep’s wool. 30-35 micron suri fiber can have as soft a handle as 16.5 micron cashmere. As a comparison, human hair ranges between 40-120 microns. (1 micron= 1 millionth of a meter!) For example, a sheet of standard copy paper is 100 micron. Soft handle is due to the flat thin scales on the fiber surface which gives off a brilliant luster. The flat, thin scales eliminate "Prickle factor" commonly felt in wool items. The longer fibers of the Suri in clothing items prevent pilling (which occurs in cashmere, camel, and vicuna clothing). Suri has an unusually high tensile strength and in particular, provides strength as the "warp" in woven goods. Suri fiber is most similar to kid mohair in terms slickness which can cause "slip" during processing. This can be overcome by adding humidity to the fiber processing area.